After three years of negotiations ... could it be that in July 2013 a plea deal was finally reached between Dede's attorney and the Prosecutor. In exchange for her full cooperation (polygraph/ GJ testimony / trial testimony /stings etc.) Dede would be granted immunity from prosecution for her participation in the happenings encompassing the disappearance of Kyron as well as obstructing the investigation by withholding of knowledge regarding the role of others? 1. June 4, 2010 - DeDe's Whereabouts? Sources also tell KGW that, during the period of time DeDe was unaccounted for, her car remained at the property where she had been gardening. According to sources, that detail is significant because, if DeDe left the property as investigators believe, she would have had to leave in another vehicle. Meanwhile, at a Wednesday press conference, investigators focused on the movements of the Horman family pickup truck on the day Kyron disappeared. Investigators specifically asked for any witnesses who might have seen the pickup in that same area of Skyline between 10:15 and 11:30 a.m. Sources tell KGW that investigators identified that as the time between when Terri left a Beaverton Fred Meyer and her next known stop, at her personal gym. More: Truck sighting locations. Investigators spent Sunday searching the home where Spicher gardened the morning of June 4. The person who owns the house where Spicher gardened, who is cooperating with investigators, told investigators she called Spicher on her cell phone but she didn't answer, the source told KGW. A person who was working with Spicher, who is also cooperating with investigators, told them of trying to unsuccessfully find Spicher. Both people have told investigators they have no idea where Spicher was during that period of time. Asked about her own whereabouts on June 4, Spicher says was at a 38-acre nursery preparing for a garden tour the following day. "I never left the property that day," she says. At least one witness told police he or she saw a second adult waiting in Terri's truck while she was with Kyron at his school science fair the morning of June 4. Multnomah County Chief Deputy District Attorney Rod Underhill said a witness, or witnesses, have reported seeing someone else by the Hormans' extended-cab pickup while it was parked in front of the school between 8:15 a.m. and 8:45 a.m. on June 4, the day Kyron disappeared. Underhill said investigators want to identify anybody "in or in immediate proximity to that truck." "We're looking for additional witnesses," he added, standing in the Brooks Hill Historic Church across from the school in front of blown-up photos of the Horman truck staged at each location. The appeal to the public comes as investigators continue to try to determine the whereabouts of Terri Moulton Horman and her friend DeDe Spicher during overlapping hours on the day Kyron disappeared. Criminal justice experts say authorities likely are also seeking to support testimony they obtained from witnesses before an investigative grand jury. KATU now knows that friends purchased cell phones to communicate with the stepmother of missing Kyron Horman after the second grader disappeared two months ago. Additionally, one of those friends did so using a fake name, according to multiple sources on Friday. A friend of Terri Horman said the secret phones were intended to provide some level of privacy with their conversations, which they felt were being monitored by law enforcement. The pair also assumed they were under surveillance. "Any conversations that we wanted to have, we'd go out into the yard," Spicher says. "When we were in the house, we'd talk about the kids, we'd talk about her marriage, talked about her family." Is everyone aware that the LE agencies involved in this case, have the capability to listen to both sides of the conversation on those bat phones within 100 yards of TH, which is probably how they learned about them in the first place? The deputy inside the home, and undoubtedly trailing TH in the following weeks was also wired. Point is, this little brain trust of hers, who now find themselves in the middle of a criminal investigation, are not masterminds. Considering Terri and Kaine were meeting the school bus ... who did Jim Kelley and his neighbor observed in a white pick up truck at 3:15 PM on June 4, 2010 and then again at 2:00 AM the next morning? Why did official searching resume in the same area in August 2010 and what was the focus? A tip from Dede who was cooperating with investigators according to her attorney? Prepaid cell phones? "We had two odd sightings of a vehicle on our road Friday," Kelley said. Around 3 p.m., he and a neighbor reported seeing a white pick-up truck with a female driver pull to the end of the long road, idle and then turn around. Then again at 2 a.m. Saturday morning, a similar white pickup truck appeared, idled and when a neighbor loosed her dogs, eased away." 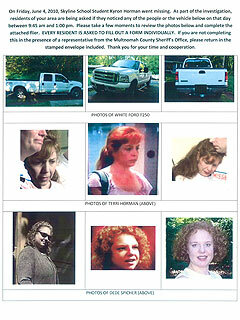 Could DeDe be the red head in truck …. Crews returned to northwest Portland on Saturday in the search for missing 7-year-old Kyron Horman. FOX 12 has confirmed that a tip from DeDe Spicher -- a friend of Kyron's stepmother Terri Horman -- is what sparked the search. Search teams were seen near a field off Cornelius Pass Road, about one mile south of Skyline School. Kyron was last seen at the school June 4 and his stepmother was the last person known to have seen him. In 2010 Dede was called to appear before the Grand Jury but did not testify. Could it be that an immunity deal was in the negotiating stages? Could there have been immunity deal afforded to her former child advocate boyfriend at the same time? "Technically she has a form of immunity for whatever she testified to. That would have been crafted by the state accordingly, and is my belief is the reason she was not asked any questions last week." B"
" .... I have learned that she is waiting for the DA to offer her immunity to testify about what she knows and her involvement. ...."
FOX 12 confirmed that a tip from DeDe Spicher -- a friend of Kyron's stepmother Terri Horman -- is what sparked the search of at least one area. In 2012 ... citing the Fifth ... Dede refused to answer pertinent questions when deposed by Desiree's attorney. Multnomah County sheriff's investigators looking into the disappearance of Kyron Horman, a second-grader who went missing from Skyline School on June 4, 2010, were interested in the whereabouts of Spicher on that day. Spicher declined to answer any questions posed by Young's lawyers on Oct. 5 that involved Terri Horman, Kyron's stepmom, or Kyron -- each time asserting her Fifth Amendment constitutional right not to incriminate herself. In 2013 Dede did testify before the Grand Jury. Could it be negotiations were finalized and Dede was afforded an immunity deal in exchange for the truth pertaining to her involvement and the involvement of others in the happenings leading up to and beyond the morning when Kyron went missing ... an immunity deal in exchange for cooperating with investigators in doing their bidding in bringing about a resolution to the Kyron Horman case? Could it be that the reason MCSO and the District Attorney's office would not respond affirmatively to media queries regarding the alleged claim she was "unofficially" cleared of wrongdoing is because the definition of an immunity deal implies otherwise? Considering there were no preceding or following major network interviews that implied a substantial financial windfall ... considering the timing of the Blink interview as it related to the GJ testimony ... could it be that it was all smoke and mirrors instigated by Dede and investigators in an attempt to indirectly inform Terri and her attorney that she had been busted? In other words ... when the immunity plea deal is considered ... it would be in Terri's best interest to cooperate with the investigation. A Multnomah County judge this week granted motions by District Attorney Michael Schrunk and Sheriff Dan Staton to delay Desiree Young's civil lawsuit against Terri Horman for nine months. Chief Deputy District Attorneys Norm Frink and Rod Underhill and Elden Rosenthal, Young's civil lawyer, declined comment Tuesday on the development. But the sheriff indicated there are some developments in the criminal inquiry into Kyron's disappearance, which his investigators have discussed with prosecutors. "There are a couple of investigative pieces that are going to open up," Staton told The Oregonian Tuesday. "Our belief is they're going to open up several investigative doors." He said the new "investigative avenues" are based on information collected in the early phase of the investigation that are now yielding some results. The sheriff said it does not include cell phone data or emails. "The case is still progressing, still evolving,'' Walls said. To pursue the civil case and to go after the police records could threaten the criminal case, she explained. Young said she wants no part of hindering that criminal investigation. A key witness was now cooperating with investigators, according to Young's attorney. He said that DeDe Spicher has testified before the grand jury for the criminal case. Spicher was friends with Terri and her whereabouts were in question the day Kyron vanished. She had previously declined to speak with investigators or testify. During Tuesday’s press conference, Kaine Horman did express disappointment over Desiree Young’s dropped civil suit. The blog claimed Spicher said she has been unofficially cleared and given immunity in Kyron's disappearance. BlinkOnCrime's Christina Stoy said Spicher told her she has cooperated with the investigation since Kyron disappeared, and that she passed a polygraph test in connection with the case in July. The latest development in the ongoing investigation into the disappearance of Kyron Horman involves Dede Spicher, a close friend of Kyron s stepmom Terri Horman. In an October 2012 deposition, Spicher pleaded the 5th to a number questions about the Kyron case. The questions ranged from Kyron's disappearance to whether she was a friend of Terri Horman. 7. June 2015 - Kyron's Mom - In the Know? The position of Kyron's parents regarding the involvement of Terri and Dede in the happenings encompassing the disappearance of their son has not wavered in five years. When Kaine and Desiree's ongoing briefings with investigators regarding case updates are considered ... it makes sense that their words are derived from an official foundation. Kyron's mom and stepdad toured the Wall of Hope that is located in Beaverton, adding new decorations. Desiree says the day is about her son, but it's also about Terri Horman, Kyron's stepmother and the last person cops said was with him. Desiree's still convinced Terri is the one who took Kyron. What legal foundation was Judge Garrison deriving from when he ruled that Terri's request to change her name was not "consistent with the public interest"? In August, Terri Horman told a Douglas County judge that she needed a new name "to start over a new life without having the stigma of Horman attached to it." She said she hadn't been able to find a job in the past four years. She also said her life had been threatened, and she was worried about her safety. At that time, she had sought to change her name to Claire Stella Sullivan. Circuit Judge Randolph Lee Garrison denied Horman's attempt. "Your connection to the Kyron Horman disappearance is something of great public interest," Garrison said. "There are folks that say that you have nothing to do with it. There are others that think that you have. "As long as this matter remains unsolved, unresolved and until more information is given by you about that, it doesn't seem to be in the public's interest to change your name,'' Garrison said. State law requires judges to approve name changes, unless a judge "finds that the change is not consistent with the public interest." 07:50 AM - (Horman Residence, 15725 NW Sheltered Nook Rd, Portland, OR 97231) - Terri convinces Kaine that the pick up truck is required that day to bring Kyron's science project home from school. Terri Horman leaves home with Kyron and Kiara in Kaine's pick up truck. Terri picks Dede Spicher at a location close to Skyline Elementary. DeDe's vehicle is parked out of sight. 08:00AM - 08:20AM - (Skyline Elementary, 11536 NW Skyline Blvd, Portland, OR 97231) - Terri, Kiara, Kyron and DeDe arrive at Skyline Elementary. Terri parks in front of the school. Terri, Kiara and Kyron head directly to the classroom where photos of Kyron and Kurtis are taken with their respective science projects. DeDe remains with the vehicle. DeDe moves the white pick up truck from the front of the school to a side exit. Upon exiting the classroom following the photo-take Kyron's jacket and backpack are intentionally left behind on his desk. Terri, Kyron and Kiara immediately leave the school through a side exit where Dede is waiting in the white pick up truck. DeDe drives a short distance to retrieve her vehicle. 08:35 AM - (40 Acre Property, 13000 Northwest Old Germantown Road, Portland, OR) - Terri follows DeDe to her place of employment. DeDe parks her vehicle in a visible location purposely leaving behind cell phone. Dede makes her presence known. DeDe leaves property unnoticed in Terri's pick up truck along with Kiara and Kyron. 09:00 AM - (Fred Myers, 11425 SW Beaverton-Hillsdale Hwy Beaverton, OR 97005) - Terri claims in an email to have in her possession a 9:12 AM timed receipt from Fred Myers. While Terri is inside the establishment DeDe, Kiara and Kyron remain in the pick-up truck. 09:30 AM - (Fred Meyers, 15995 SW Walker Rd, Beaverton, OR 97006) - Terri drives to a second Fred Meyers. While holding Kiara ... Terri has an encounter with Andrea Leckey allegedly between 9:30 AM and 10:00 AM. Kyron and DeDe remain in parked pick up truck. 10:00 AM - (Magic Cleaners, 16035 SW Walker Rd Beaverton, OR 97006) - Store owner reveals in a 2013 media interview that Terri was in the establishment ALONE. No Kiara. DeDe, Kiara and Kyron remain in parked pick up truck. 10:45 AM - (Sauvie Island Bridge) - Records allegedly reveal pings from Terri's cell phone that originate on Sauvie Island ... pings that motivated several official searches. As prearranged by Dede's former child advocate boyfriend ... Kyron is handed over to UNIDENTIFIED participant/s with safe haven network. Dede's child advocate former boyfriend called media attention to himself 2 1/2 months following the disappearance of Kyron ... Dede's child advocate former boyfriend whose family is affiliated with children ministries in Mexico. The implication? Dede and her former child advocate boyfriend were convinced by Terri that Kyron was at risk. The implication? Kyron was secreted away by unidentified member/s of a underground child advocate network to an unknown location. The implication? Terri, Dede or Dede's former child advocate boyfriend are not privy to the whereabouts of a secreted Kyron. The implication? DeDe and her former child advocate boyfriend have been afforded immunity in exchange for the truth encompassing the disappearance of Kyron and will be the Prosecutor's star witnesses against Terri in an upcoming trial. 11:40 AM - (24 Hour Fitness, 1265 NW Waterhouse Avenue Beaverton, OR 97006) - Terri arrives at gym. Kiara is left in gym's childcare (?). DeDe remains in the vehicle. 01:00 PM - (40 Acre Property, 13000 Northwest Old Germantown Road, Portland, OR) Terri drives DeDe back to 40 acre property where DeDe makes her presence known. When questioned regarding her absence ... DeDe insists she had been on the property all morning. 01:15 PM - (Horman Residence - 15725 NW Sheltered Nook Rd, Portland, OR 97231) Terri returns home with Kiara. Terri emails photo of Kyron taken earlier to contacts ... emails Desiree. 02:00 AM - Terri does not attend the talent show at Skyline ... the talent show that Kyron is a scheduled participant. Terri does not bring home Kyron's science project? Backup Court documents/videos/articles to support my "theory" will be provided upon request. When briefings with investigators are considered ... could it be that the mutual belief of Desiree and Kaine that Kyron may still be alive is based on evidence ... evidence that was gleaned from Dede Spicher in 2010 while being interrogated ... Dede Spicher who was allegedly granted immunity from prosecution in 2013 prior to agreeing to testify before the GJ? "I believe that he’s stashed. I believe it's the investigation that's going to lead us." "We honestly believe that he's alive and that Terri had planned this for awhile and manipulated the situation to take Kyron." For the last 5 years, Horman has lived each moment believing his son will be found.
" I have an open invitation with Law Enforcement and certified Search and Rescue Teams to search my property ... any day ... any time. When I was called ... I SAID "NO" TO THE PRIVATE SEARCH but I immediately said and ... I will continue to say ... any-time the Sheriff's Office and the Search and Rescue teams want to come with their dogs it's all-right. My property has been search more than the school has probably. My invitation is open ... always open." "I just want to clarify there was a search done Kaine’s property the first couple of days after Kyron went missing. These were search and rescue dogs with a scent article looking for a LIVE child. Cadaver dogs have never set foot on his property. Not once! While Desiree, Me and my family pray everyday this is not our outcome we need answers. Kyron deserves for us to have these answers. He deserves to be found. Why would a father deny any mother the piece of mind knowing he is not there? Why can’t he do that for her for Kyron? Not only has he denied us the opportunity to search his property but he is denying law enforcement the access to do so as well. Hmmmm"
I am not very well informed on the intricacies of the legal system here and who sees what and when, but I am a little confused as to why circuit court judges would be looking at this already, and we have a grand jury going. I would really appreciate it if somebody that knows, would explain this process. TIA. In newly released transcript from a June hearing Kyron father say that police now have mounting evidence against the boy's stepmother. "It significantly strengthened their believe that she had involvement. ..."
"Terri hasn't been the only focus, Law enforcement has been very thorough about ruling people out. They don't have tunnel vision. We got to Terri because of Terri. We got to Terri because of all of her emails and all of her GPS information on her phone and all of the eyewitness accounts that were conflicting with her timeline. We know who did this. We know who's involved and we know the basic circumstances. ..."
If Kaine and/or Desiree says it I believe it! It makes perfect sense to me if the parents of Kyron had not been convinced by investigators in ongoing briefings that gathered evidence implicates Terri in the the happenings encompassing the disappearance of their precious son who they have not embraced for 5 1/2 years ... the focus for answers they desperately seek would have taken a different direction. THE MAY 2010 911 CALL? When ongoing briefings with investigators are considered ... logic dictates ONLY the quoted words of Kaine and Desiree can be considered a reflection of the truth ... words that have an official foundation. In 2010 Terri Horman lied to Blink's source "a close family friend" who claimed that a 911 call was placed following an assault (not sexual) by a landscaper who was angry that he was being fired. Video (5:25): "The MFH plot was completely bogus. The person who done that had an axe to grind because he had made forward advances towards me on Mother's Day of that year and I told him to leave that I had no interest in that. I was married and wanted none of that whatsoever." "The teacher thought I said I was going to take Kyron with Kitty for a doctor's appt.," she wrote on June 5, 2010. "I said I was going to look at other exhibits - how do you mess that up? His coat and backpack were still at school. I left the school at 9 and he was seen with a man 'chaperone' and 2 girls after I left. There were no men on the chaperone list. That and it was highly chaotic - had to been 300 people running around - no coordination ..."
... Through Spicher, Horman also confirmed that out of concern for Horman’s “spacieness” which she defined by walking into a room and staring off, not remembering, etc, Terri Horman called his pediatrition Thursday June 3rd and made an appointment for Friday June 11th. His last day of school. Horman also told Spicher that Kyron had wondered off or got lost while in his teacher Ms. Porter’s care once before when following a fellow student out of class. Terry said that she told her pediatrician and later the police that she suspected that there was somethng off about Kyron leading up to the weeks before his disappearance. Terri: I would walk into his room and there were things he was doing to himself that told me there was something wrong ... that somebody was touch him improperly. Interviewer: So you are telling me that he was maybe being sexually abused? Terri: Possibly ... and that was a concern of mine. Interviewer: What is your theory about what happened? Terri: He was taken from school. Interviewer: So you think that a stranger came and abducted him. "It wasn't a stranger that came into Kyron's school and took him. It was someone we knew in our trusted circle." .... "We firmly believe that Terri has worked with people on this, had help after the fact," Young said. Several of their text message exchanges June 30, obtained by Kaine's lawyer from law enforcement, were redacted in Exhibit A filed in court, but Kaine's lawyer alerts the court that she has the complete, unredacted copy that could be made available for the judge's examination. "It is just sickening. The matter of whether or not she is involved in Kyron’s disappearance aside, given her disassociative activities while her 7 year old step-son was missing, and her apparent Fugly coping, I would not let her my child under any set of circumstances. Rackner will prevail, even though I think there were parts of her motion that could harm her own client. Less is more. Interviewer: Let's face it. Your stepson is still missing. Your are in the midst of all this scrutiny and you are sexting with some random guy. It doesn't look good. Terri Horman: No it doesn't. I am not going to make an excuse for it. I'm going to own up to it. So many hard questions regarding Terri's alleged involvement in the disappearance of Kyron went unasked in the recent ABC/People Magazine interviews ... hard questions that relate to the circumstantial evidence that Desiree revealed when responding to the interviews. Logic dictates that the mother of Kyron Horman is not lying ... is not pulling her words out of thin air. Think about it. Desiree is desperately seeking answers in regards to the happenings encompassing the disappearance of her son ... her precious son who she has not embraced for 5 1/2 years. It makes sense that her claim of an official foundation must be a reflection of the truth. I attempt to put myself in her place. I am hoping that Blink will ask the hard questions in her upcoming interview with Terri. Blink: "I now truly understand WHY DDS was believed to be complicit if TH had been. ... "I can see how MCSO went down that road so to speak." Why was Blink's revelation not shared by Dede in the 2013 interview? Inquiring minds want to know why was it only gleaned recently from Blink's yet to be published interview with Terri? Could it be that info forthcoming from the upcoming Blink interview with Terri will satisfy inquiring mind who really want to know if on the morning of June 4, 2010 did Dede leave Westwind Farm or didn't she? 1. In 2010 Blink cites "several sources" who claim Dede did leave the Farm. 2. In 2010 KGW cites "several sources" who claim Dede did leave the Farm. 3. In 2010 Dede states in a People Magazine interview that she never left the property. 4. In 2013 Dede states in a Blink interview that she never left the property. PORTLAND, Ore. -- DeDe Spicher and Terri Moulton-Horman were both unaccounted for during the same period of time the day Kyron Horman disappeared, based on information revealed by investigators and on information from KGW sources. These timelines leave a one-hour, fifteen-minute block of time in the middle of the day Kyron disappeared where the whereabouts of both Terri and DeDe was still under investigation. Investigators spent Sunday searching the home where Spicher gardened the morning of June 4. The person who owns the house where Spicher gardened, who is cooperating with investigators, told investigators she called Spicher on her cell phone but she didn't answer, the source told KGW. A person who was working with Spicher, who is also cooperating with investigators, told them of trying to unsuccessfully find Spicher. Both people have told investigators they have no idea where Spicher was during that period of time. A Blink On Crime Exclusive: DeDe Spicher speaks for the first time about her ordeal in the Kyron Horman investigation. DeDe's story has never wavered. DeDe arrived at her job at Westwind Farm Studio–a sprawling and lush forty-plus acre property scheduled to be on the Garden Conservatory Tour the next day. She parked at the main house, left her cell phone which was turned on, and her lunch cooler in her Ford Explorer. If innocent of wrongdoing ... why would Dede Spicher assert her Fifth Amendment right when responding to all questions by Desiree's attorney in a 2012 deposition pertaining to her whereabouts on the morning of June 4, 2010 as well as questions pertaining to Terri Horman? A friend of Kyron Horman's stepmother, DeDe Spicher, claims she has been unofficially cleared of suspicion in connection with the boy's disappearance, according to a crime blog. Spicher declined comment when contacted by The Oregonian Wednesday. She referred all questions to her attorney, Chad Stavley, who also declined comment. In 2010 could it be that Dede's own attorney was implying that texts and email exchanges between Terri and his client would provide an investigative foundation that may result in an secret indictment against Terri being unsealed and served? Could it be ... at that period in time when communication had ceased with Terri ... Dede was afforded "limited" immunity for a measure of cooperation ... for throwing Terri under the bus? He added that Spicher is not speaking to Terri Horman. 2010 - Form of Immunity? 2013 - No Contact with Terri? Spicher asks if she can at least discuss it with her dad, a retired deputy with the Klamath Falls Sheriff’s Office. Herron said she could, but that he could not discuss it with her attorney, either. 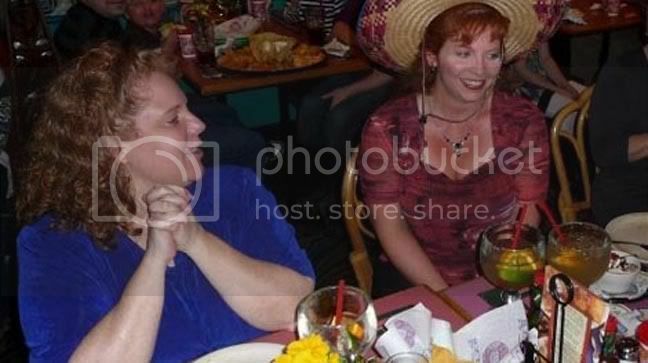 Spicher told them it was 10: 00 PM , and reminded them that she has not had any contact with Terri since July 2010. Could it be that Blink's upcoming interview with Terri will reveal that "GPS information" gleaned from Terri's cell phone placed her in the vicinity of Westwind Farm on the morning of June 4, 2010? Desiree's belief since the get go that both Terri and Dede were involved in the happenings encompassing the disappearance of her son has not wavered. It makes sense that ongoing briefings imply that Desiree's belief has an investigative/official foundation. KATE SNOW: And there was something else that gave Desiree and Tony a sinking feeling that something wasn't right. They say Terri's cell phone records apparently didn't match up with where she said she was on the morning of Kyron's disappearance. Page created in 2.36 seconds with 20 queries.